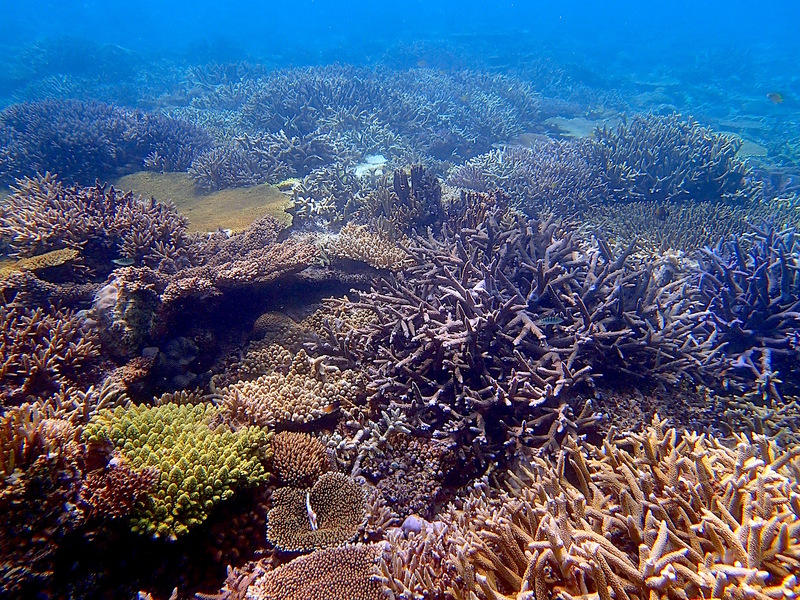 A team from the Okinawa Institute of Science and Technology Graduate University (OIST), led by Group Leader Chuya Shinzato in Professor Noriyuki Satoh’s Marine Genomics Unit, has analyzed the genome of 155 samples of Acropora digitifera corals and proposed a new theory on how coral populations have migrated within the Ryukyu Archipelago, in southern Japan. Their findings have just been published in Scientific Reports. Recent recovery of coral reefs in the Sesoko Island in the Okinawa Islands. OIST scientists analyzed the genome of 155 samples of Acropora digitifera corals, collected across the Ryukyu Archipelago. In particular, they focused on subtle genetic variations that can be used to differentiate these corals into subpopulations. OIST scientists took into account 905,561 of these variations, called single nucleotide polymorphisms or SNPs, pronounced “snips”. 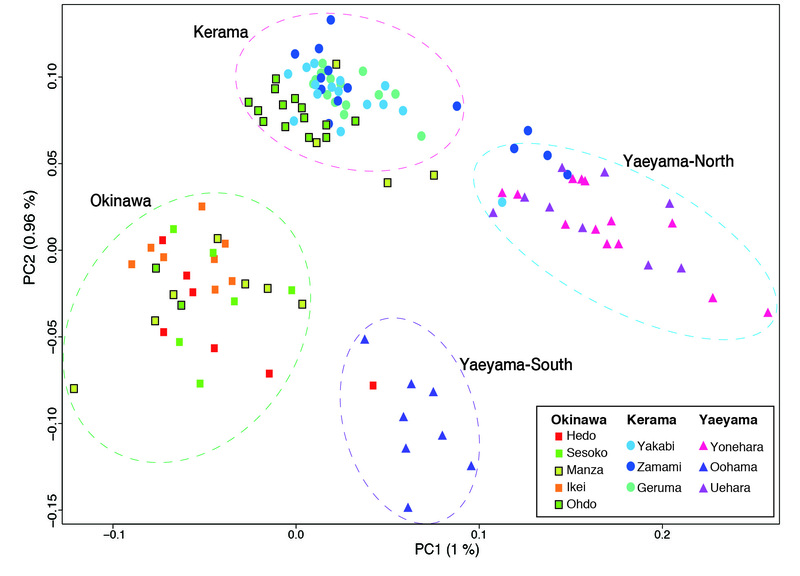 The genome analysis showed that the corals divide into 4 groups, corresponding to their geographical distribution: the Okinawa Islands, the Kerama Islands, the Yaeyama-North and the Yaeyama-South. This result has significant implications regarding the recovery from the 1998 coral bleaching. “If the corals in the Okinawa Islands were repopulated thanks to migration of coral larvae from the Keramas, we would expect to see the genetic clusters of Okinawa Islands and Kerama Islands merging together. Instead these clusters are very distinct,” explains Dr Chuya Shinzato, first author of this study and active member of the Coral Reef Conservation and Restoration Project spearheaded by the Okinawa Prefecture. “This result shows that the coral populations of the Okinawa and Kerama Islands have not met recently. It means that long-distant larvae migration by spawning within the Ryukyu Archipelago is less common than what was previously thought.” It is therefore more likely that the survivors of the 1998 bleaching in the Okinawa Islands repopulated themselves, without mixing with the corals from the Kerama Islands. 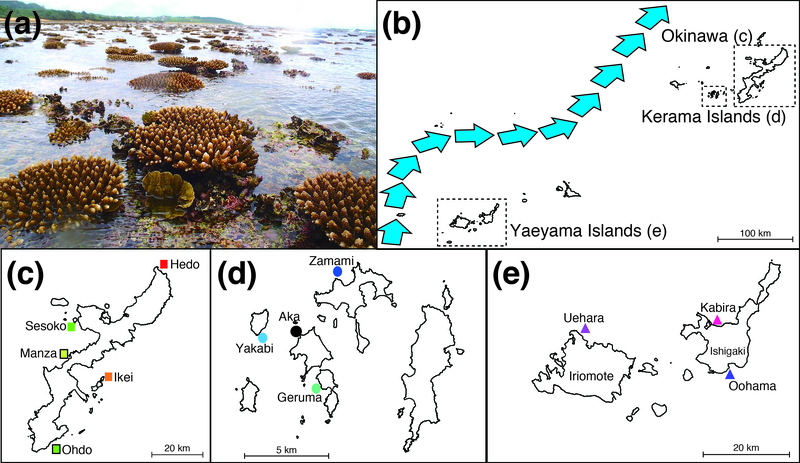 Acropora digitifera corals (a) were collected in four locations of the Ryukyu Archipelago (b) in southernmost Japan: the Okinawa Islands (c), the Kerama Islands (d) and the Yaeyama Islands (e). The warm Kuroshio ocean current is indicated by blue arrows. Genome analysis of coral samples collected from the Kerama, the Okinawa, the Yaeyama Islands, with each square, circle and triangle representing one coral sample. The samples cluster in 4 groups indicating that the coral larvae did not migrate between locations. Well-known for the richness of their corals, the Kerama Islands won the status of a Japanese national park in 2014. The Keramas were believed to be the point of origin of coral migratory pathways in the Ryukyu Archipelago. However, OIST researchers have discovered that these Islands are sinks of coral migration, rather than sources. 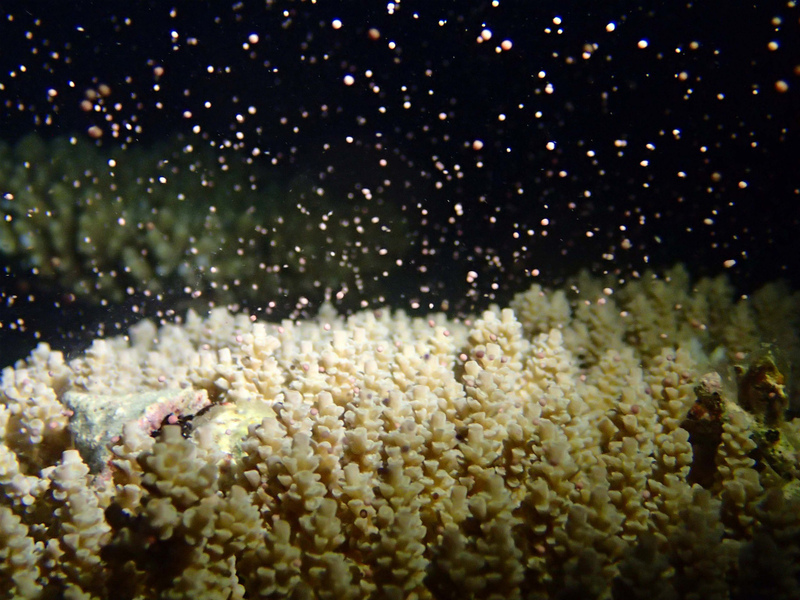 Their “melting pot” explains the abundance and diversity of the Keramas’ corals. On the other hand, in the case of another disruptive event, such as coral bleaching, the Keramas’ corals cannot guarantee the recovery of the affected areas. “We need to protect coral reefs locally all over the Ryukyu Archipelago,” points out Dr Shinzato. Dr Chuya Shinzato, first author of the study, 'Genome-wide SNP analysis explains coral diversity and recovery in the Ryukyu Archipelago'. Acropora digitifera coral synchronized sprawling.